Litecoin price failed to hold the $155 support and declined against the US Dollar. LTC/USD remains at a risk of more losses as long as it is below $150. Litecoin price struggled to move higher and declined below a major support at $155-150 (Data feed of Kraken) against the US Dollar. There is a major bearish trend line forming with resistance at $155 on the hourly chart of the LTC/USD pair. The pair may continue to move down and it could even break the recent low of $137 in the near term. 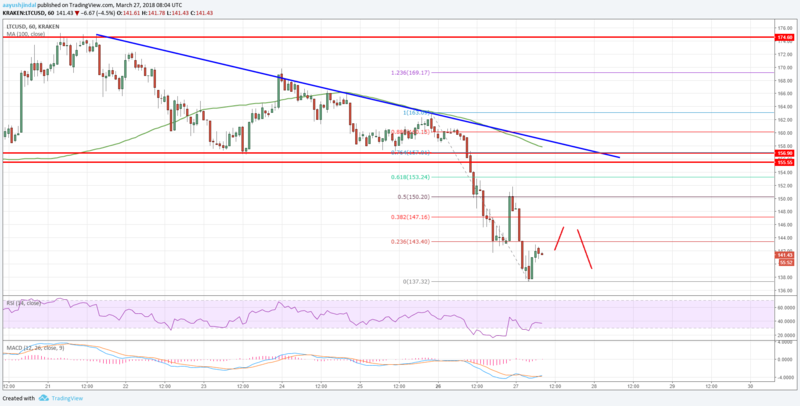 There was no upside move in litecoin price above the $165 resistance against the US dollar. The LTC/USD pair started a downside move and traded below the $155 and $150 support levels. The downside move was substantial as the price even broke the $140 level. Now, the price is well below the $150 level and the 100 hourly simple moving average. There is a minor correction underway from the $137 low. An initial resistance is around the 23.6% Fib retracement level of the decline from the $163 high to $137 low. Any major upsides are likely to be capped since there are many hurdles on the upside near the $150 and $155 levels. The stated levels were supports previously and now they will protect gains above $155. Moreover, there is a major bearish trend line forming with resistance at $155 on the hourly chart of the LTC/USD pair. Furthermore, the 50% Fib retracement level of the decline from the $163 high to $137 low is positioned near the $150 level. Therefore, the $150 level may perhaps stop the current upside wave. On the downside, the recent low of $137 is a short-term support. A break and close below the mentioned 137 level could open the doors for more losses towards $125. Overall, the current price action is bearish below $150 and litecoin price will most likely continue moving lower in the near term.